I am a fan of kale. I like its earthiness, and when I eat it, it seems to have a solid and grounding effect on me. Kale is one of those foods which in recent years has become ultra-trendy to eat, but given how nutritious it is, its popularity can only be a good thing. Its nutrition profile is so long it needs a whole page of its own, so it goes without saying that for hair and health benefits it’s right up there at the top. You can get your dose of kale in many forms: juices, smoothies, raw ‘crisps’, braised, in soups, however you fancy. 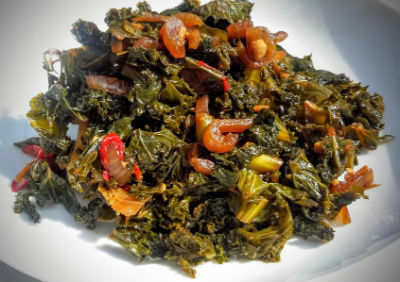 Here is a simple braised recipe, similar to that of Jamaican ‘steamed’ callaloo. Using a medium heat, sauté all the seasonings (garlic, onion, sweet (bell) pepper, scotch bonnet and thyme) for a few minutes. Add kale and tamari/soy sauce and continue to cook to your desired doneness. Kale is not readily available in my neck of the woods, what can I substitute it with. You’re in luck because any dark leafy green vegetable can be substituted for kale in this recipe. They have similar nutrients so there is no need for you to miss out on the goodness!